Touch your silver pieces as little as possible as fingerprints accelerate tarnishing. All silver exposed to air will tarnish over time. It can also be tarnished by certain foodstuffs, including vinegar, eggs, etc. Silver is a soft metal which can be dented or damaged when handled roughly. Silver abrades easily and should not come in contact with other materials. 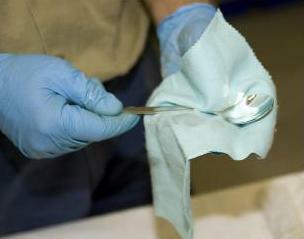 Swab surface with methylated or white spirit to remove grease and dirt – some tarnish may also be removed. Use this method when you see the surface of your silver objects looking dull or yellowish. If tarnish remains, try gently rubbing a silver cloth over the surface – this has mild abrasive particles embedded in it. To get into small corners with the silver cloth, cut out a small square, make a cotton wool swab, wrap the silver cloth round the swab and use the swab to push the silver cloth into the small areas. You can also try a mild abrasive paste, cream or foam. Rub gently over the tarnished area in a circular motion. Remove silver foam residues with a swab moistened with distilled water. Heavy tarnished silver (decorated surfaces) may need to be cleaned with a silver dip. chemicals that help remove tarnish.